Purple Door Ice Cream currently shares a space with Clock Shadow Creamery. Wisconsin is one of a handful of states that recently made it easier for small businesses to raise money. Crowdfunding allows the public to donate cash to small, emerging businesses, via the internet. In some cases, that money buys them equity or shares of companies. For some, investing is all about making money. But there’s one local group whose goal is to make a little cash while building a better community. It’s called Fund Milwaukee. Purple Door Ice Cream is one local company that has benefited from Fund Milwaukee. 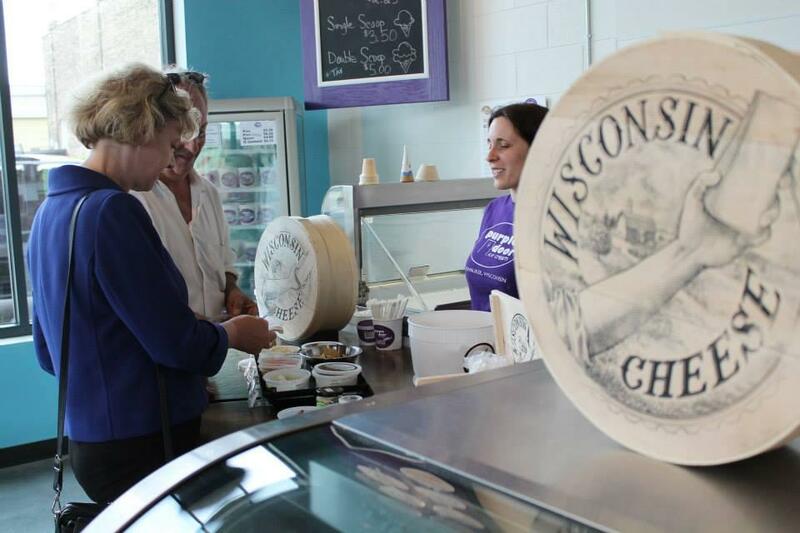 Walk into the Purple Door Ice Cream shop and the first thing you notice-- cheese. That’s because the shop shares a salesroom and kitchen with Clock Shadow Creamery. But Purple Door plans to move to another location in the Walker’s Point neighborhood in order to double their production. Laura Schultz and her husband own Purple Door. They’re former educators who followed their passion and now make ice cream for a living. Their flavors range from pumpkin spice and fig with black tea to chai with pink peppercorn and whiskey, made with Kinnickinnic Whiskey from Great Lakes Distillery right down the street. Schultz says the couple could not have pursued this dream without Fund Milwaukee. It’s a group of novice investors who lend money to small local businesses. It enabled Schultz to secure a five-year loan for more than $100,000 to help with the move. She won’t say how much interest the investors are likely to earn, but generally, Fund Milwaukee provides four to six percent. Juli Kaufmann started the group. She says members can sit on the sidelines if they wish. “There is no financial requirement to join. You don’t have to give any money; you don’t have to lend any money,” Kaufmann says. Kaufmann says Fund Milwaukee has about 75 members. They are not accredited investors.That means their incomes are less than $200,000 and their net worth is less than a million dollars, not counting their homes. Kaufmann says because of that, they had to find a way to legally invest in local businesses. “The way friends and family models work for unaccredited investors is they say hey look, we know each other. We’re friends, we’re family. We’ve gotten to know each other and we’d like to support each other. The FCC doesn’t regulate that. They don’t prevent people from giving a certain amount of funds to each other,” Kaufmann says. Kaufmann says Fund Milwaukee members want to earn a return on their money, but also invest in their community. “One of our members works at the city of Milwaukee. He’s only invested in one deal over the course of two years. He invested at a $1,000 and for him that was a significant amount of money. And until that loan that he made is paid back from Purple Door Ice Cream in this case, he doesn’t have any other funds to invest in something like this,” Kaufmann says. Kauffman says there’s no denying that risk is involved. But she says of the one million dollars Fund Milwaukee has invested in its two years of existence, only one loan for about $3,000 is outstanding. Still, Scott Brunner, an attorney with Meissner Tierney Fisher & Nichols, worries about the inexperience of those lending money. "This opens up possible traps for people who don’t do their own due diligence,” Brunner says. Investors need to be OK with the possibility that they may never recoup their money. “If you’re not a high net worth individual, or if you don’t have a high income level automatically, you have less of an ability to bear that risk or tolerate losses if they occur,” Brunner says. While Fund Milwaukee offers potential pay back with interest, Wisconsin and the federal government have been loosening laws on crowdfunding. It lets people donate cash to emerging companies via the internet. The goal is to help those businesses grow and create jobs. People crowded onto street in Walker's Point Thursday night, to celebrate the official opening of the new Clock Shadow Building. Attendees dug into freshly scooped ice cream and fresh cheese curds – both produced on site. WUWM Environmental Reporter Susan Bence stepped into the four-story structure to explore it unique elements. Half the building that now stands atop a remediated brown field is made of repurposed material.